Take three guesses as to what sort of game this might be. Yes, it's strip poker! 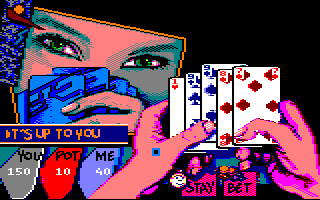 Actually, this game has much better graphics than the other strip poker offerings on the CPC (and how do I know that?). As with all other strip poker games, when the girl loses all her money, she takes off an item of clothing and you get to see a picture of her. As I've already said, the graphics are very good indeed, and a soothing bit of music on the title screen sets the atmosphere well. However, I'm no good at any type of poker, anyway – and why are only 32 cards used by both players instead of 52? The hyperspatial wireways have been invaded by aliens, and it's your job to eliminate them all – not an easy task when there are 99 of them! You control a zapper which moves along the rim at one end of each wireway, while the aliens appear at the other end and move towards you. You must merrily unleash a hail of bullets at them, trying to prevent any of them reaching your end of the wireway. If you feel overwhelmed, you can use a super zapper, but you only have one of these on each level. 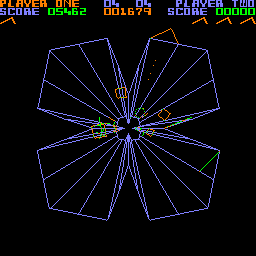 This game was a classic in the arcades, and it has been converted very well, with great vector graphics, marvellous sound effects, and addictive gameplay. It's excellent! This is Loriciel's second tennis game for the CPC, and it's a pretty good one as well. Although you can't play in any tournaments, the game allows you to customise the abilities of both yourself and your opponent in several areas – namely service, forehand, backhand and volleys. You can also choose whether to play on a cement, clay or grass court. 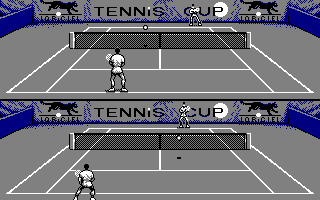 The game uses a split-screen technique which shows the view of the court from both ends, which is very useful in two-player mode, where both players have a clear view of their own end of the court. 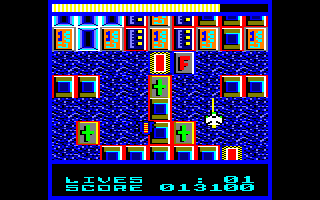 Although the graphics lack colour – and the colour schemes that are used have not been chosen well – the animation of the players is excellent, and after a few practice sessions, it's a very playable game as well. See also: Tennis Cup II. A very polished and impressive tennis game, making good use of the Plus' capabilities. It is indeed one of the most in-depth tennis games on the CPC. 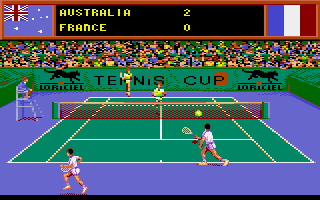 The graphics and sound effects are very good and the game has so many options to select from – one- and two-player modes, training and practising different shots, playing on different surfaces such as clay, grass and hard court, taking on other countries in the Davis Cup, or playing the Grand Slam tournaments. You can configure options such as the match length (1, 3 or 5 sets) and game speeds, and you can also select split-screen or normal single-screen viewing mode. But wait; there's even more! There is a credits system to change the attributes of your player, giving them more or less ability in things like serving, passing shots and smashes. 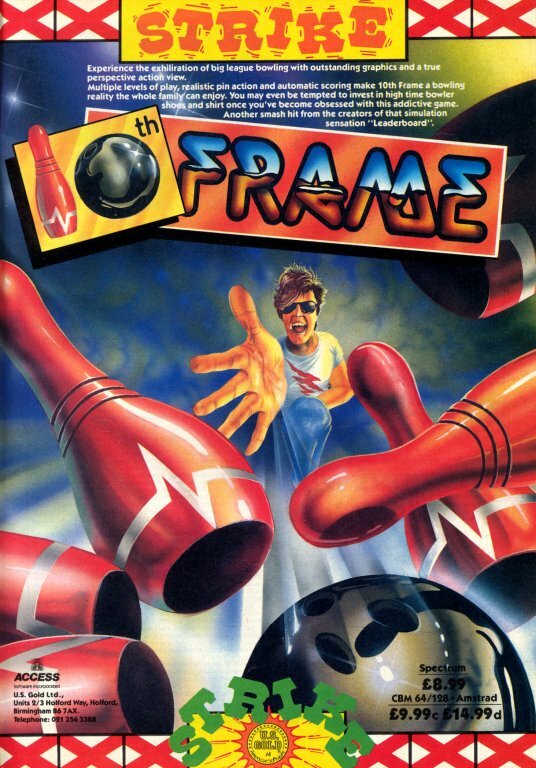 Another bowling game hits the CPC. Upon loading, you are met with a request to enter your name. You then choose the weight of the ball and the skill level before the game begins. Choosing your start position leads to selecting the spin used when releasing the ball. Pressing fire animates the player sprite in slow, flickery motion. The ball then travels along until it goes out of view. Once you've done all of this, you realise that this game wasn't thought out too well. Its poorly defined graphics and screen format, mixed with dismal effects, just add to a very dull game indeed. 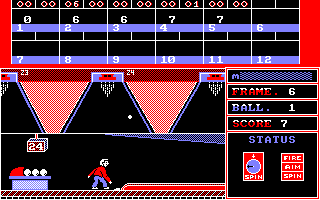 There aren't many ten-pin bowling simulations around for the CPC, but this is one of them, and it's really rather average. Up to eight players can take part in either open or league bowling, and there are three skill levels – kids, amateur and pro. First you align your player, and then use a cursor to aim your shot. 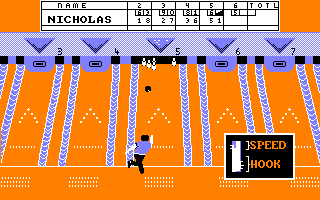 The animations of the bowler are impressive, but the colour scheme is garish, the sound effects are dreadful, and getting a strike seems to be difficult even on the kids skill level. Teodoro No Sabe Volar is a great arcade adventure game that features great graphics, fast-paced gameplay and strong grab factor. The graphics are really cool; something between Rick Dangerous II and Phantomas Saga: Infinity, they have great colours, smooth animation and great sprite design. The scenery is also very detailed. A minus here is the small playing screen. The sound is not the strong point of this game but it is adequate and fairly supports the game. The gameplay is excellent; assisted by the graphics and the good collision detection, the scenery keeps evolving and changing until the game is completed. This is a magnificent, albeit short, gem. A robot, T1000, has been sent back in time to terminate a young boy called John Connor, but some humans have sent another robot, T101 (that's you) to protect him. 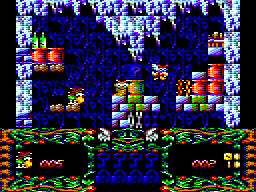 The game has seven levels which rotate around three styles of gameplay – beat-'em-ups (levels 1, 4 and 7), driving from an overhead view (levels 2 and 6), and puzzles where you must slide tiles to create a picture (levels 3 and 5). Thankfully the puzzles are only bonus levels, and it isn't necessary to complete the puzzles in order to go to the next level. It's a big game with marvellous graphics – check out T1000's face on the fifth level – but the gameplay is definitely also there. It's the year 5027, and Brain, the leader of a rebellious teenage gang called the Wanglers, has been captured and is being held on the prison planet of Terminus. The remaining four Wanglers – Mobod, Xann, Spex and Magno – must find him, in a huge maze consisting of 512 screens. Each Wangler behaves in a different way, and you control one Wangler at a time. There are teleport stations that allow you to select another Wangler, and they also act as a restart position if a Wangler is killed. This is a very colourful game with awesome graphics, especially when you consider the year it was released. The sound isn't all that good, but the gameplay and the urge to explore the maze make up for this. The Wanglers are cute, too! A group of three mining engineers have been exploring a planet, but now they must escape in their spaceship. 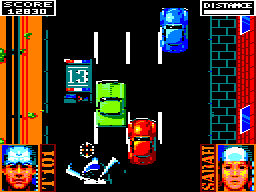 This was one of the first games that Code Masters released for the CPC. It's a vertically scrolling space shoot-'em-up with graphics which are at times horrible, but thankfully the gameplay compensates for this. Steer your spaceship through the obstacle course and avoid walls, force fields, droids, and time shift blocks which will take your ship all the way back to the start – very annoying when you've come so far! You also need to collect fuel regularly, and extra lives can also be collected. There's nothing at all which makes this different from any other space shoot-'em-up, and it can sometimes be hard to distinguish what is a wall and what isn't, but it's still fun to play.